Pre! sites have been released for two species: Rat (Rattus norvegicus) and Chinese softshell turtle (Pelodiscus sinensis). The rat assembly Rnor_5.0 (GCA_000001895.3) was submitted by the Rat Genome Sequencing Consortium. This assembly is composed of 21 chromosomes and 1439 unplaced scaffolds. Click here to go to the rat Pre! site where you can view alignments of rat proteins from UniProt and RefSeq, and alignments of human, rat and mouse translations from Ensembl release 67. The Chinese softshell turtle assembly PelSin_1.0 (GCA_000230535.1) is composed of 19,904 unplaced scaffolds. It has undergone a full Ensembl gene annotation and these results, including RNASeq, will be released in Ensembl 68. 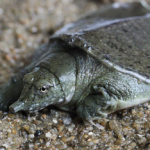 Click here to go to the Chinese softshell turtle Pre! site. Next Next post: Ensembl Genomes 14 has been released!